eVolo Magazine just announced the winners of its 2018 Skyscraper Competition. One of this year’s honorable mentions is “Manhattan Ridge: Affordable Housing for Commuters” by Zhenjia Wang and Xiayi Li, a proposal based on the premise that “people who work in Manhattan deserve a home in Manhattan.” Therefore, they’ve created a new, tripartite vertical system in which residents would consume and recreate “downstairs” and work right next to where they live. The existing buildings would remain and this new vertical space would rise up their facades. 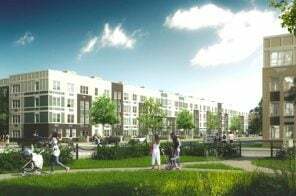 Fisher Brothers unveiled on Tuesday the 17 finalists chosen for its “Beyond the Centerline” design competition after receiving more than 150 submissions. Participants were asked to think of creative and ambitious ideas to transform the traffic medians along Park Avenue between 46th and 57th Streets. 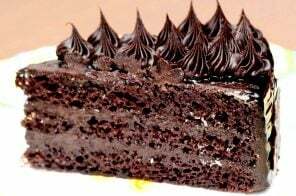 The finalists did not disappoint. Proposals call for an Alpine mountain, a massive aquarium, floating gardens, mini-golf, an elevated walkway and more. 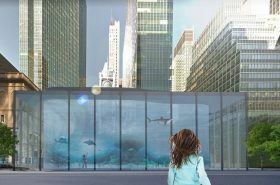 Although a jury will select the grand prize winner, all 17 proposals will be on display for public voting at Park Avenue Plaza, located at 55 East 52nd Street, from March 5 to March 9 for the second-place prize. Below, check out all of the unique projects. 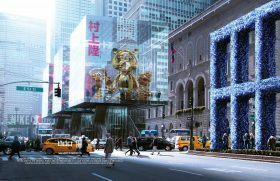 In November, Fisher Brothers first launched a design competition to bring life to the boring traffic medians along Park Avenue, between East 46th and East 57th Streets. The privately-funded contest, dubbed “Beyond the Centerline,” aims to spur creative thinking and unique ideas never before considered for the traffic medians. 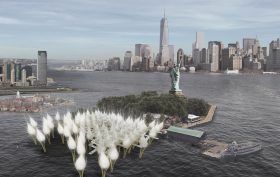 After the developer received more than 150 submissions from landscape architects and urban planners, the list has been narrowed to 17 finalists (h/t New York Times). 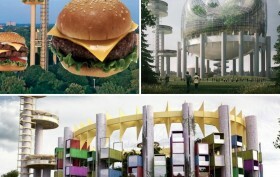 Stand out proposals from the finalists include a mini-golf course, a glass aquarium and a curvy, elevated park. Yesterday, 6sqft shared a proposal for an inside-out Midtown tower that received an honorable mention in Evolo’s 2017 Skyscraper Competition. 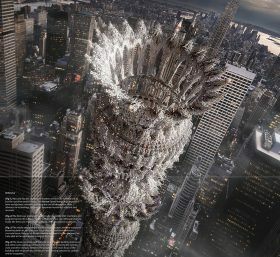 Another that made the list is the Flexible Materials Skyscraper, an idea for a Billionaires’ Row supertall with an exterior made of a new material that can be folded, cut, sewed, and turned over, falling into a pattern. The designers called it “draping,” and hope building skyscrapers with flexible materials will allow architects to explore a new model of building while also cutting down on the construction process. 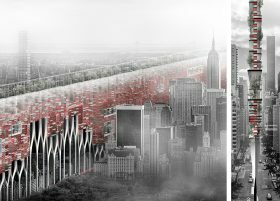 Yesterday 6sqft brought you the winning design from Evolo’s 2016 Skyscraper Competition, a proposal to dig down below Central Park, exposing the bedrock beneath and thereby freeing up space to build a horizontal skyscraper around its entire perimeter. 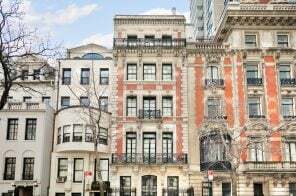 The second-place entry is more traditional in the sense that it builds up, but it’s more outside-the-box when it comes to function. 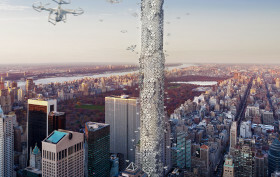 Titled The Hive, the project reimagines 432 Park Avenue, the city’s tallest and most expensive residential building, as “a vertical control terminal for advanced flying drones that will provide personal and commercial services to residents of New York City.” By covering its facade in docking and charging stations, the building gets its hive-like appearance with the drones buzzing around like bees. 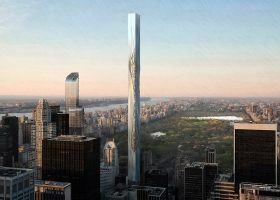 How does 432 Park get transformed into a giant drone control terminal? 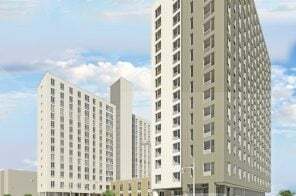 Evolo has announced the winners of its 2016 Skyscraper Competition, and, somewhat ironically, the number-one spot goes to a proposal that doesn’t build up at all, but rather digs down. 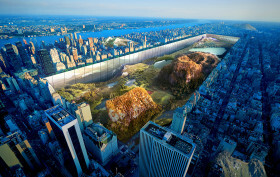 New York Horizon was imagined by Yitan Sun and Jianshi Wu as a means to “reverse the traditional relationship between landscape and architecture, in a way that every occupiable space has direct connection to the nature.” The idea is to dig down, exposing the bedrock beneath Central Park and thereby freeing up space to build a horizontal skyscraper around its entire perimeter. 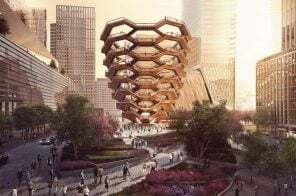 The resulting structure would rise 1,000 feet and create seven square miles of interior space, 80 times that of the Empire State Building.